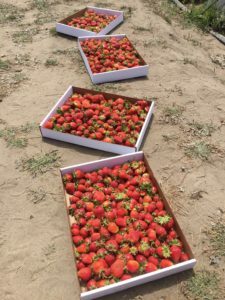 This week, we went organic strawberry pickings for the first time in 2 years. Though we ate strawberries from time to time, we never made all the yummy extras that we always had in the past. To understand why, read my post about not so organic strawberries. My kids are ecstatic that we’re strawberry picking again…and they picked 12lbs! All the way home, they discussed all the yummy treats we’d make. Besides making jam, I needed a way to save strawberries to continue enjoying them, even when strawberry season is over. If you find yourself with extra strawberries, consider trying this as an easy ways to save and enjoy strawberries.